The problem described by Vincent is simple enough: for each input string, return the string in lower case, except for the initial character, which should be in upper case. For example: vIncEnt should become Vincent. If you compare this code to the original, you will notice that although this modified example adds an assignment to cache the value, it saves at least one call to the getString() method in the generic case. However, because the input value used in the example is longer than one character, it also saves another call done in the else branch of the if statement. So all in all, we can avoid two calls to getString() in this example. The compatibility mode is just that: a way to stay compatible with the old Kettle 2.5 behaviour. While this is useful to ensure your old transformations don't break, you really should consider not using it for new transformations. rows per second, which is a 7% improvement as compared to the previous solution, and a 74% improvement as compared to the original. First, let us realize that the original problem does not presume a particularly difficult transformation. We just need "something" that takes one input value, and returns one output value. We don't need any side effects, like writing to a file. We also don't need to change the grain: every input row is matched by exactly one output row, which is similar in layout to the output row, save for the addition of a field to hold the transformed value. This transformation complets in just 6.5 seconds, and the calculator processes rows at a rate of 155327,7 per second. This is 32% better than the previous solution and 236% better than the original. The result is truly amazing: The transformation completes in just 3.1 seconds, with the user-defined Java expression step processing at a rate of 324886,2 rows per second. This is 109% faster than the previous solution, and 603% faster than the original. One of the things I haven't looked at in detail is adding more parallelism. By simply modifying the number of copies of the transforming step, we can use more cores/processors, but this is an excellent subject for a separate blog post. Daniel Einspanjer from Mozilla Coorp. created a 30 min. video demonstrating this hands-on! He adds a few very interesting approaches to squeeze out even more performance. 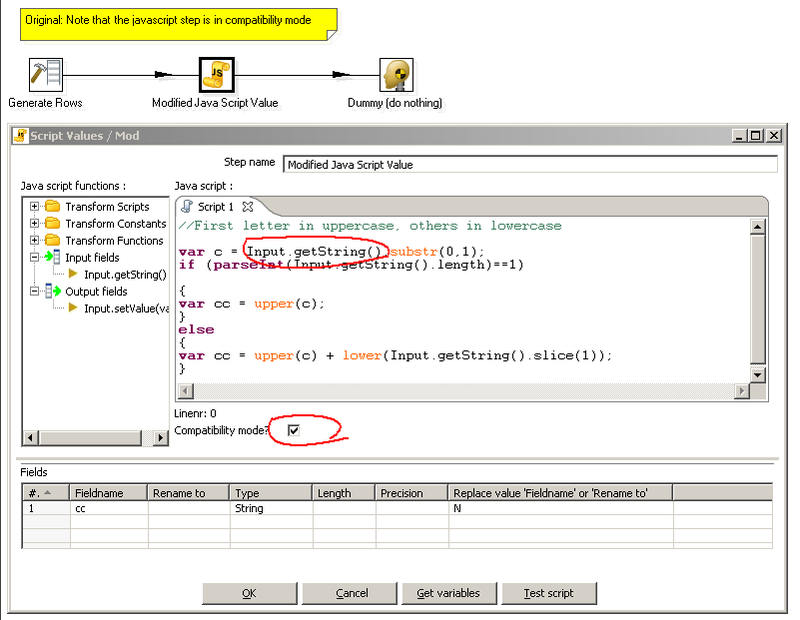 Also very interesting about the Java expression step. Going to have to play with that one. Very deep and very detailed. Superb post. I'm going to change / improve my routines by using yours. Java Expression is great. I hope we have documentation soon. @Paul: thanks for you mentioning me in your blog, and thanks for the link to the documentation of the java expression step. I modified my post to link to the documentation. It's very interesting to see the difference in execution time between the various methods! Thanks for posting this! Rodrigo: thanks, great tip. And thanks for the link: this is ignorance on my part, but I did't know this one existed. If I can find some time over the weekend, I will do another post and add a few more optimizations Daniel Einspanjer showed in his video, as well as show the effect of multiple threads. Note that the performance tip you mention isn't talking about creating a new JS step, but just a new JS script tab inside the existing one. A JS startup script is great if you need to construct some heavy-weight and long-lived objects such as a regular expression or a big lookup hashmap. In this case, you still have to create new string values for every row, so you aren't really going to save much in terms of performance if you just declare the holder of those values in a startup script. Daniel, Thanks for the correction. Actually you're saying that it is not going to save much in terms of performance, but by doing this I reduced the execution time from 9.7 seconds to 8.1 seconds and from 103,018.4 r/s to 122,850.1 r/s in the 4th correction that Roland did, the one that starts as "Eliminating unncessary code" making it almost 20% better in terms of performance!!! Let me know how to [link]search jobs[/link] in Chennai , please forward the same. Thanks for this site, really is good. U also interested maybe in [link]new style dog grooming[/link], site really good too! and in many cases, they will actually use their google profile whilst commenting. From there, I try to find their blog or website, and then I do WHOIS, or if that fails some general googling. It is amazing that usually you will find some contact details within 10 or so minutes. I then call them by phone, and usually I get the owner of the website to which the spammers themselves are afilliated. You should try it, it has worked for me so far. Could you help us we are facing big issue in pentaho kettle.. I don't think your questions have anything to do with this blog article. please post this kind of stuff in a public forum.